This was really the only one from Orly's winter collection that I really wanted. I love white polish that looks like snow, and from swatches I could tell this one fit perfectly. Here it is at three thin coats with not top coat. Notice how it dries to a satin-matte finish. Beautiful! I really don't know which way I prefer. It's gorgeous both ways! In a day or two I'll probably end up putting China Glaze Snow Globe over it. And here is a bonus picture of another pet: my little feather-baby named simply Little Bird or LB for short. I took this picture because I thought it was a hoot that Neiman Marcus sent one little bottle of nail polish (Nars Purple Rain) in this big ol' box. LB is extremely curious (doesn't he look like he's reading the label? 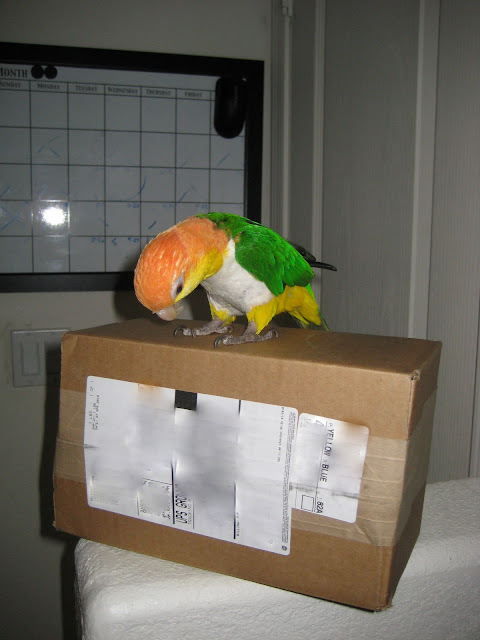 haha) and destructive, so most likely he tore right into the box shortly after this picture. This white is absolutely gorg on you! I think I might break my polish punishment to get this! I love these shimmery whites!! :) Perfect for winter. Gorgeous! Awww, I love green cheeks <3 I used to have sun conure, but those are SOOOOO loud! This is such a lovely color! I think I like it shiny the most. Beauty! Love this color! And your pictures are gorgeous!! !